Another Apple smartwatch rumour hits the mill and this one has a little feel of truth, although we have read a fair amount of Apple smartwatch rumours that sounded good and didn’t come to anything. This one from a mostly reliable Chineseblog, that says sources on the ‘supply chain’ have told them about Apple and Intel partnering up to make this new Bluetooth smartwatch. The smartwatch will have a 1.5-inch OLED display, run with Bluetooth 4.0, have a similar OS to the iPod Nano and might have voice recognition technology that responds to commands, like a sporty Siri. Apple have been fitting all their latests devices with Bluetooth 4.0 and there is a good reason for this, with the Bluetooth connection, you can receive calls, emails and other notifications from your various devices on your smartwatch. Many suspected that the next version of the iPod Nano would become a smartwatch. After Pebble, a small company, placed a Kickstarter and gained over $10 million in funding, it showed that a lot of people want a smartwatch, 70,000 backed Pebble. Instead, Apple went with an odd design for the iPod Nano, making it taller and giving it a run down OS with circles. We looked at the iPod Nano and thought, why aren’t you a smartwatch? Sales for the Nano have been poor and lower than the previous edition and we suspect Apple are looking to end that line and start with the smartwatch. 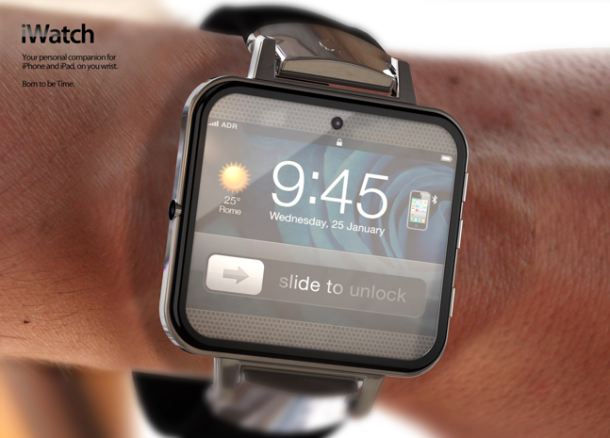 We are unsure of the title, many on the web have taken to calling it ‘iWatch’. Intel have been looking to get a grasp on mobile processing, as Qualcomm lead with their Snapdragon S4 Pro. We are seeing some new phones come with an Intel chip, but they aren’t flagship quality. Getting connected with Apple will be good for Intel, especially with Samsung’s relationship starting to fall apart.